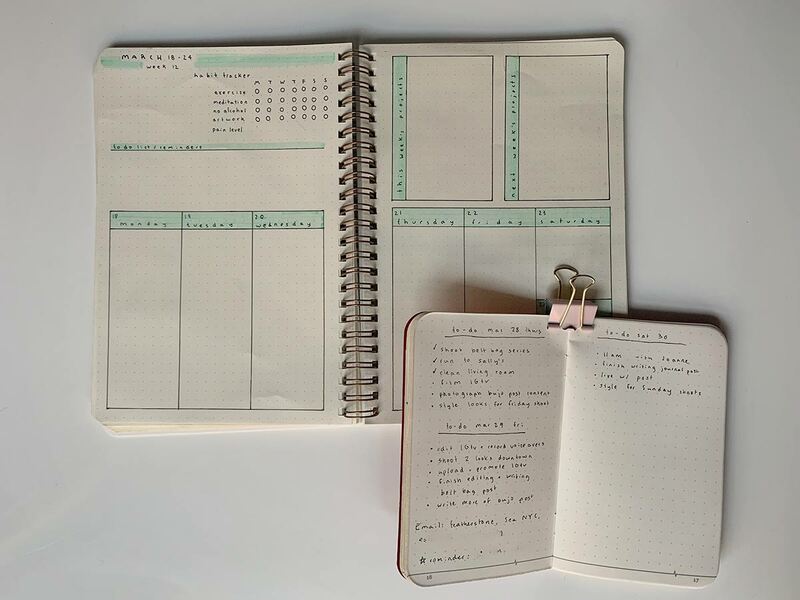 I have wanted to do a post about bullet journaling for months but I have had to hold off until I found a system for my journaling that I was happy with. 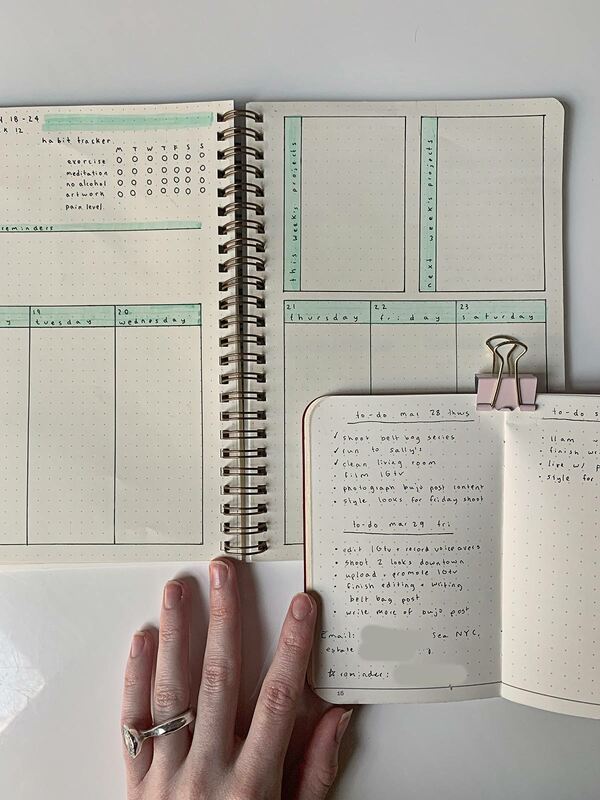 In case you are wondering what bullet journaling even is, it’s journaling system designed to “to help you track the past, organize the present, and plan for the future” (as described by it’s creator Ryder Carrol). 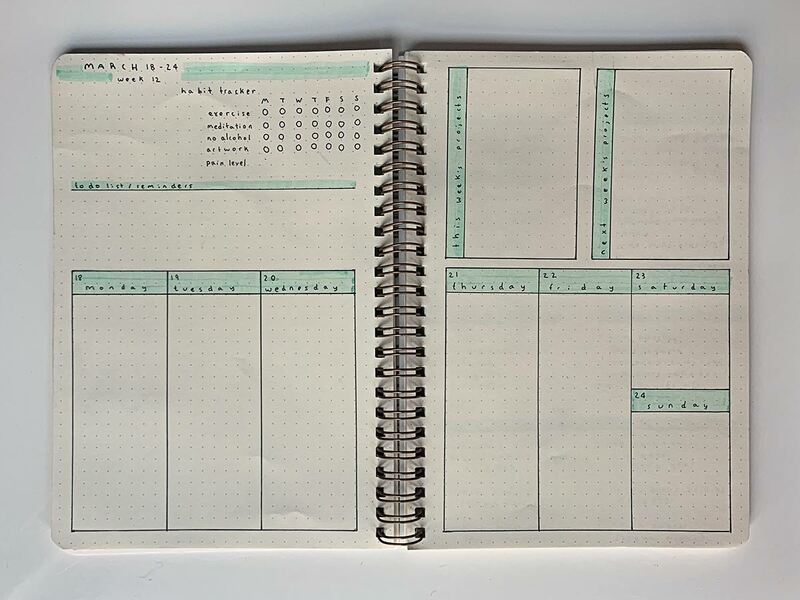 A quick scan of the #bujo (shorthand for bullet journal) hashtag on instagram will yield a plethora of meticulously hand drawn weekly planners and other organizing method. Some people get very creative with adding artwork, or creating elaborate sleep trackers. I have a more parred down approach to bullet journaling that works for me! Running my own business, planning ahead and writing down ideas and to-do lists is absolutely crucial. Before I started using a bullet journal, I was already a big fan of pen and paper journaling for productivity and mindfulness. After years of being fed up with my screwy iCalendar, I figured it was time to try a low-tech approach to planning. I bought my first bullet journal last summer and haven’t looked back since. 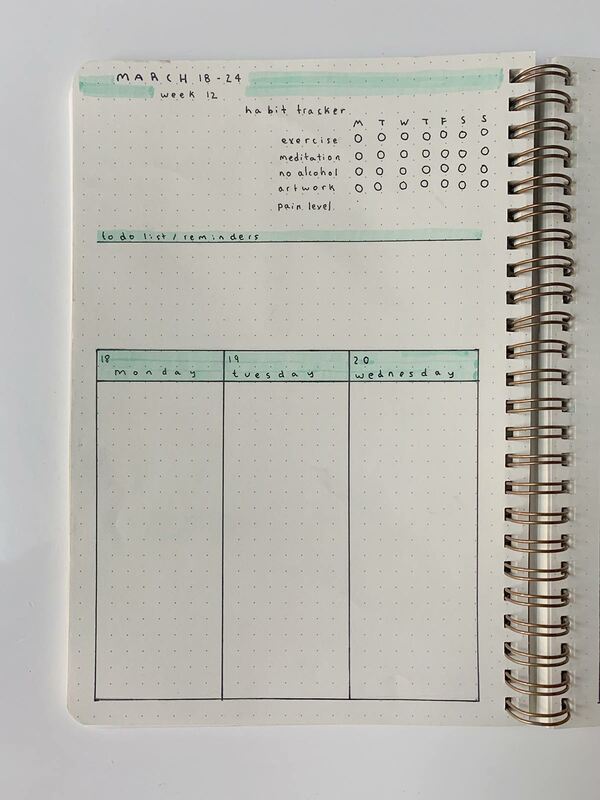 When I first started bullet journaling, I made my planner too complicated. I created a weekly planner that allotted space for meal planning, health tracking, and content planning. After much trial and error, I now use a simple two page weekly planner format that includes a bit of habit tracking, two categories for project planning (present and future projects), and a long vertical format to allow lots of space for notes and scheduling for weekly planning. I had a breakthrough moment recently about planning and productivity. As someone who runs my own business and has an ever-changing schedule: I needed two forms of planners to perfect my system. 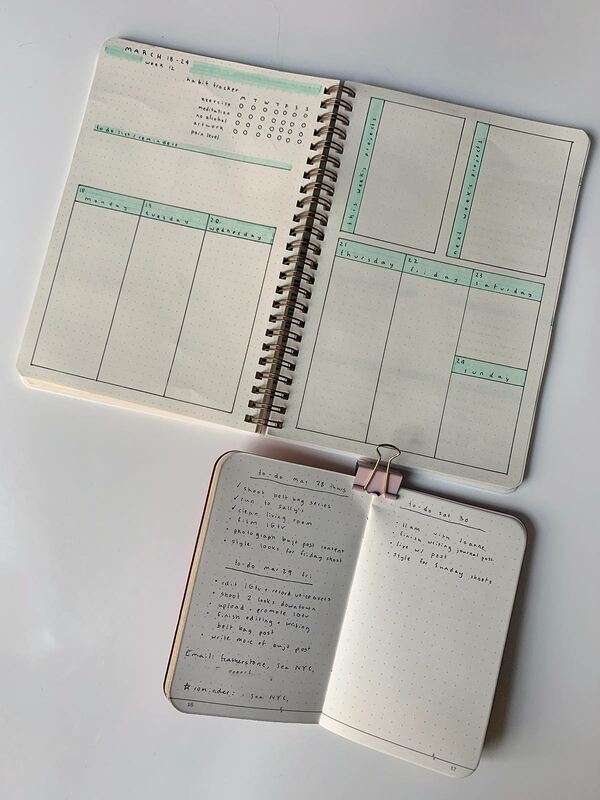 I needed a weekly planner that would allow me to take a broad view of my week and what I wanted to accomplish during it, and a mini planner to keep with me at all times that broke my goals down into actionable items and easy to understand to-do lists. 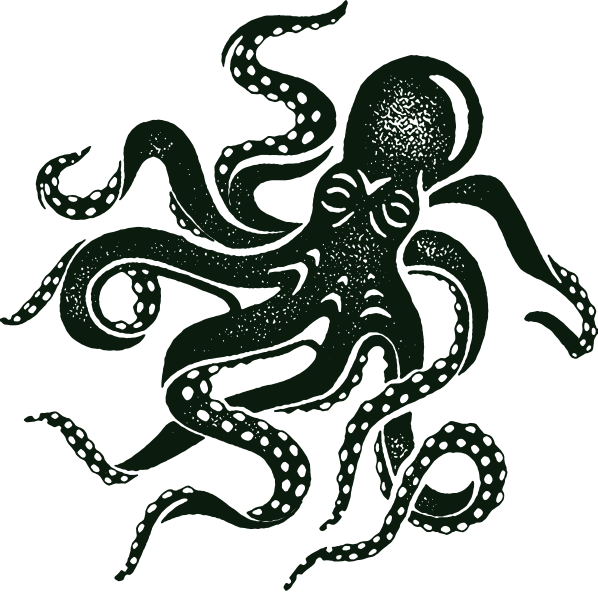 As a creative, my goals are often lofty and nebulous, and I juggle many of them at a time. If I fail to break each goal down into actionable steps on my to-do list, it is much less likely to get done. My mini to-do list allows me to schedule my day realistically. My weekly planner allows me to take a longer sighted view at my goals and ambitions for the week. I have found that having both is absolutely necessary, and I keep my mini journal in my bag with me always. I have finally settled on this system as the one that works for me! In addition to my weekly planner and my mini journal, I also keep a monthly media list. I love these because I always have so many books and movies and podcasts I want to get around to, but my brain is always so crowded and fried by the end of the day I forget what they are. When I have real down time to myself, I’ll tackle a book or a movie on my list. It is very satisfying! Here is the brand of bullet journal that I use. I prefer a spiral journal personally. This is the mini journal I use. I also use Tombow pens in 01, 03, and 05 for journaling. Hope this helps! Let me know if you have any tips you’ve discovered for maximizing your journal. I always love hearing other people’s approach to productivity and organization. It really is a journey finding what works for you! I buy mine at Michales or Hobby Lobby and on Amazon. They’re Stabilo Boss Pastels and you can find them on Amazon. 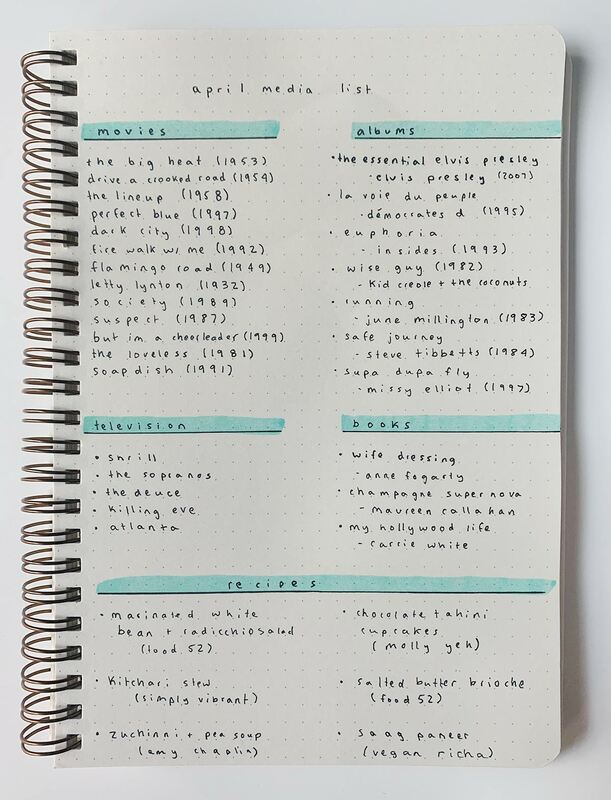 I really want to try to bullet journal! I need a bullet journal because I’m a mess! This is something I do as well! Jane, this is brilliant! I have 3 jobs and a busy social life. I cannot live without my paper diary …. forget the technology. However, I hadn’t figured out a way to incorporate wellness, self and creativity into the system. This is so inspiring. How long does it take you to set it up each week? The ‘ruling up’ part would be almost therapeutic. Jane Aldridge became one of the earliest pioneers of style blogging when she launched her Sea of Shoes in 2007. For the past decade, Jane has appeared in and worked with dozens of leading fashion publications and brands all over the world.